Palestinian Used Imprisoned Husband's Sperm To Get Pregnant : Parallels The woman is seven months pregnant. Her husband is serving 25 years in an Israeli prison for attempted murder. They wanted another baby – and smuggled his sperm out. Doctors say 10 more women are pregnant the same way. Israel says that's illegal; Palestinians call it another form of resistance. 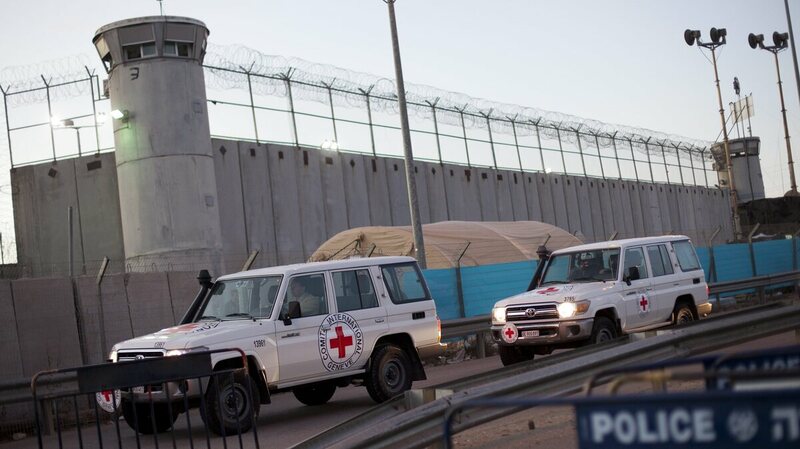 Red Cross vehicles outside Israel's Ofer prison, between Jerusalem and Ramallah. Israeli prison officials invited reporters last month on a first-ever tour of the Ofer prison, a concrete-and-barbed wire compound on the northern edge of Jerusalem. More than 700 Palestinians are detained here for alleged security violations in connection with the Palestinian-Israeli conflict. Security prisoners in Israeli custody have the same rights as inmates on criminal charges when it comes to the number of library books they can borrow, their access to dental and health care, and the right to buy items at the prison canteen. But security prisoners can't use the phone and their family visits are restricted. Immediate family can visit once every two weeks, and conversations take place with glass between the inmate and relatives. Children under 8 are allowed physical contact with the prisoner for just the last 10 minutes of each 45-minute visit. So when I heard that Palestinian women married to prisoners were sneaking their husbands' sperm out of prison, using it to get pregnant through artificial insemination, I wanted to know how they got the sperm out. Lidia ar-Rimawi did it. She is almost seven months pregnant now and feeling terrific. Besides an easy pregnancy, she is thrilled that she pulled it off. "We challenged the Israeli authorities," Rimawi told me in the living room of her home in Beit Rima in the Israeli-occupied West Bank. "We challenged the jailer." Plus, she says, having his wife pregnant with his son has boosted her husband's morale. We challenged the Israeli authorities. We challenged the jailer. But she gives barely a hint about how the sperm was smuggled from prison. She'll only say she carried it out herself and that there was a plastic bag involved. Rimawi and her husband, Abdel, (sentenced in Israeli court to 25 years on charges of attempted murder) already have a daughter, who was eight months old when her father was arrested. But by they time Abdel is released, Rimawi says they'll be too old to have more children. She was inspired to try artificial insemination with smuggled sperm when she heard about another Palestinian woman who had successfully done it. That is the only birth so far credited with smuggled sperm, though doctors at the Razan Medical Center in Ramallah, which has donated its services to this effort, say 10 more women are currently pregnant. The center's Dr. Omar Abdel Deyhem says when the first woman came with this idea they told her she should be sure to publicly declare her plans, so no suspicions would be raised if she became pregnant while her husband was still behind bars. Muslim religious leaders have issued fatwas in support of smuggling sperm, calling it a new way to protest the Israeli occupation. Sheik Sayed ar-Rimawi, the local religious scholar who approved Lidia's plans, said this is a "very important means of resistance, against an occupation that not only imprisons Palestinians, but also wants to end their ability to reproduce." Israeli prison officials are skeptical sperm smuggling is actually happening, but they say it would be considered a crime. A spokesperson for the Israeli prison system says the only way to prove it would be DNA testing, something they don't appear to be intent on pursuing at the moment. As I learned speaking to prisoners in Ofer, cell phones do make it in. Prison officials note that visitors are not usually searched on their way out. Although this seems to be something of a micro-trend among Palestinians, and carries particularly political overtones here, it's not the first place this issue has arisen. More than a decade ago, a U.S. couple successfully sneaked the husband's sperm out of prison and the wife gave birth to a daughter. The couple was caught and prosecuted. The husband is due to be released this fall. In addition, there is a debate in the U.K. about whether the National Health Service should pay for prisoners to father children from behind bars. This wouldn't involve sneaking sperm out of prison –- the debate there centers on the cost. The European Court of Human Rights says prisoners should be allowed to father children from behind bars, but the U.K. justice minister has vowed to ban the practice.